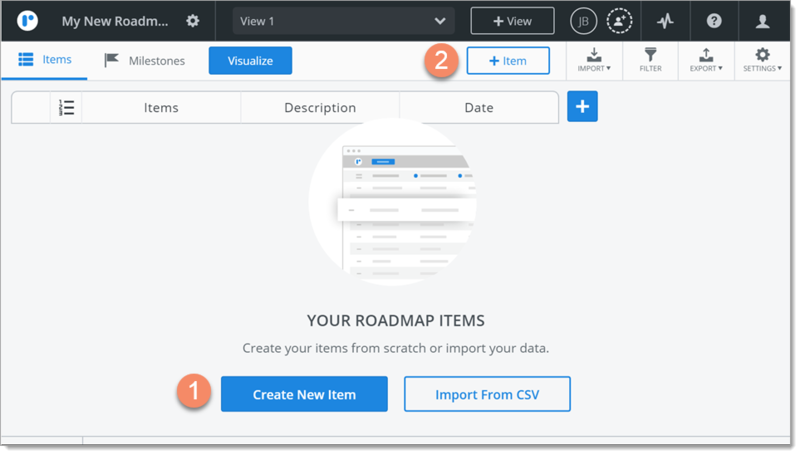 There are two main ways of creating and adding roadmap items: creating them from scratch or importing them from a CSV. In this article, we show you how to create items from scratch using the Items Table and drag-and-drop new items onto a Timeline or Swimlane. The Items Table is a tabular view of the items in a roadmap. Each row in the table is an item, and each item is made up of fields, one field per column in the table. With every item you create, a new row is added to the table. Every roadmap created from scratch starts out with two default fields: Items and Date. Although you can create a new item just by filling in the Items field, you won't get much out of your roadmap if you don't at least enter Dates. To go to a roadmap's Items Table, click the Items icon on the View navbar. 1. Click the Create New Item button (only appears when the roadmap has no items). 2. On the View navbar, click the + Item button. 4. Click Create and then click X to close the dialog. TIP: The dialog stays open until you close it so you can continue to add more items, one after another. The Items Table also has support for inline Item creation, letting you simply and quickly add Items to you roadmap. Navigate to the Items Table. Scroll to the bottom of the Items Table and click on the Add new item cell. Input your item name and press Enter when done. Notice how you are able to add consecutive items without interruption. An item's Date can be a range of dates or a specific date. 1. Click inside the item's Date field in the table to open the date picker. 2. To set a date range, select the Start Date and the End Date. To set a specific date, select it as the Start Date. The End Date is automatically set to the same date. 3. Click anywhere off the date picker to close it. TIP: You can also set the date(s) in the item card. 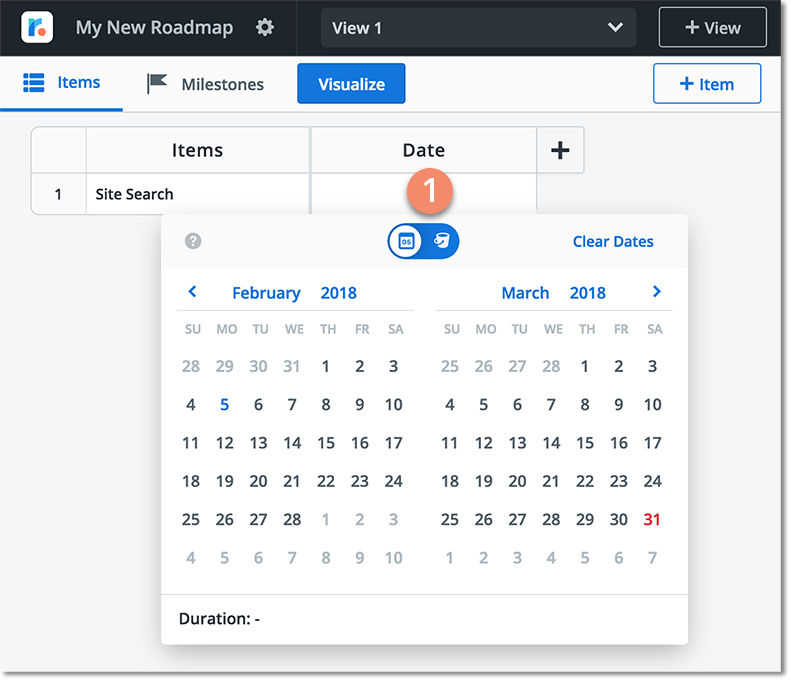 If you don't have fixed dates for an item yet, or you're adding the item to a "no-dates" roadmap or a more agile roadmap that can be pivoted on flexible or "fuzzy" time in a Swimlane visualization, you can add the item to a time Bucket such as Soon or Future. Time Buckets are used instead of dates. 1. 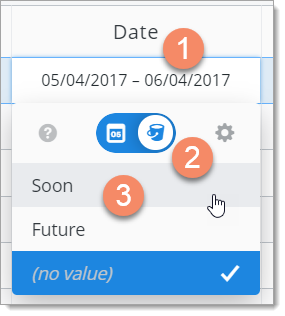 Click inside the item's Date field to open the date picker. 2. Use the toggle to switch to the Bucket dropdown. 3. Select the time Bucket you want to assign the item to (e.g., Soon or Future). TIP: If you don't see the Bucket you want, click the Cogwheel icon to open the Bucket field card and add a new value to the list. You can also open the card by clicking the Cogwheel icon on the Date header. NOTE: If you can't add a new value to the list, it means you don't have the permissions required to edit the Bucket field. The Items Table is not the only place you can add items to a roadmap. 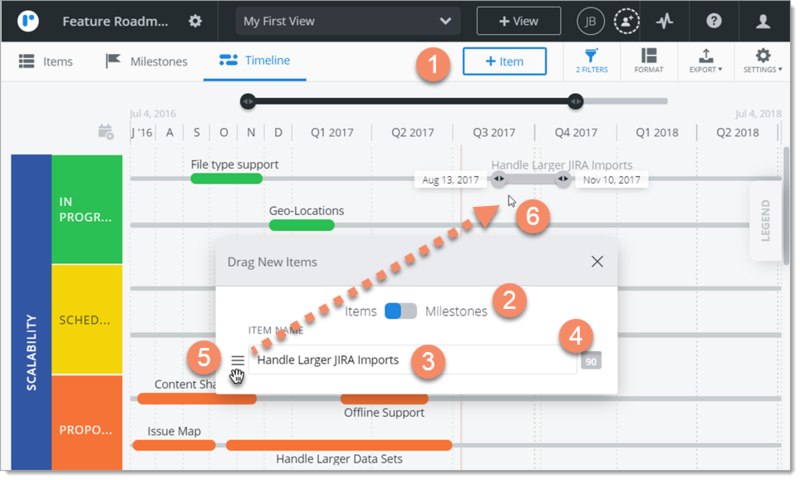 You can also add an item by creating and drag-and-dropping it onto a Timeline of Swimlane. Here's how in a Timeline. 1. On the View navbar, click the + Item button. 2. In the dialog, make sure the toggle is set to Items. 4. Click to set the item's duration in days. The default is 90. 5. Click the item's Move handle and start dragging the item onto the Timeline. 6. When the Start and End Dates you want for the item appear, drop the item ont the Timeline. TIP: If your Timeline has pivot headers set up for one or more fields, drop the item onto a stream that aligns with the pivot field values you want to add to the new item. For example, if your Timeline is grouped by Category and then by Status, and you want the item to have a Category of Scalability and a Status of In Progress, drop the item onto a stream that aligns with those headers. Dragging a new item onto a Swimlane is similar, except that the Swimlane has both vertical and horizontal pivot headers, and the horizontal header may be non-time-based. If you need to refresh your memory on how Timelines and Swimlanes work and are created, go to Visualizations: Timelines vs. Swimlanes, Create a Timeline visualization, and Create a Swimlane visualization. Who can add items to a roadmap? To add an item to a roadmap, you must be the roadmap's Owner OR the roadmap must be shared with you as an Editor. If a roadmap has been shared with you as Viewer, you have view-only access to the roadmap and can't add items to it. As a Viewer, the + Item button on the View navbar will be grayed-out and you will see a View Only icon on the Roadmap navbar. To find out more, go to Sharing and collaboration in the Quick Guide.